In the phrase ‘dat is een pak van mijn hart’ the noun ‘pak’ refers to a heavy load or burden that is ‘lifted off the heart’. The latter implies that it regards concerns or worries as opposed to physical burden. The phrase is used when something happens that is a huge relief. Other possessive pronouns than ‘mijn’ can be used and you may also hear “het is een pak van mijn hart” or the shortened “pak van mijn hart”. – Pak: parcel/package, pack/bunch, load/burden [noun] [het pak, de pakken]. – Opgelucht ademhalen: to heave a sigh of relief [verb] [haalde adem, ademgehaald]. – Blij: happy, glad [adjective]. – Spanning: stress, tension, suspense [noun] [de spanning, de spanningen]. This entry was posted in Dutch phrase of the week, DWOTD 1.0, Vocabulary Intermediate and tagged dat is een pak van mijn hart, hart, pak by Sander. Bookmark the permalink. any idea what those clay upside down cones things are used for in the picture at the top of you blog. next the fruits and vegetables, onions. to keep cheese in?Thanks for this interesting page, grew up with these curious expressions, both my parents are dutch, and are very old, so they got the old tongue happening. 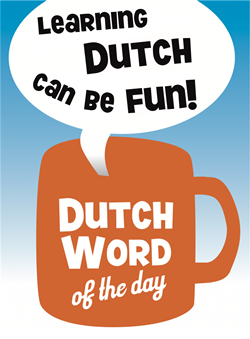 say that in dutch! There is a similar expression in English: that’s a load off my mind, which means that’s a huge relief. The difference is obviously that in Dutch, you say a load off my heart, whereas we say a load off my mind. Thanks Thomas, I’ll add it to the main translation!